According to a new market report published by Transparency Market Research “Automotive Adaptive Cruise Control Market: (By Technology: RADAR, LIDAR; By Mode of Operation: Normal Adaptive Cruise Control and Connected Adaptive Cruise Control; By Vehicle: Passenger Vehicle, Commercial Vehicle; By Region: North America, Europe, Latin America, Asia Pacific, and Middle East and Africa) – Global Industry Analysis, Size, Share, Growth, Trends and Forecast, 2017 – 2025”, the global automotive adaptive cruise control market was valued at US$ 6.60 Bn in 2016 and is expected to propagate at a CAGR of 14.27% during the forecast period from 2017 to 2025 to reach US$ 22.1 Bn in 2025. Automotive adaptive cruise control market across the globe primarily features RADAR sensors owing to its better efficiency even in adverse weather conditions. Owing to the advantages and the higher range of detection, the RADAR sensor is expected to be more preferable option than LIDAR sensors. The growing adoption of automotive adaptive cruise control systems in the vehicles is witnessed chiefly due to increased incidences of road accidents and growing concerns towards road safety awareness. This is also likely to be amplified by government stringent policies towards the road safety. Globally, rise in younger population is also being considered as one of the major factor that is likely to boost the demand for automotive adaptive cruise control as aged population is more susceptible to retinal breaks and require effective care. Although aged population across the globe shall be more benefitted with such assistive technology with the aid to drive efficiently. In terms of technology, the adaptive cruise control system market is segmented based on RADAR and LIDAR sensors. RADAR sensors are dominant market share holder of the adaptive cruise control system market, which accounts for about 83.12% share of the total revenue in 2016. 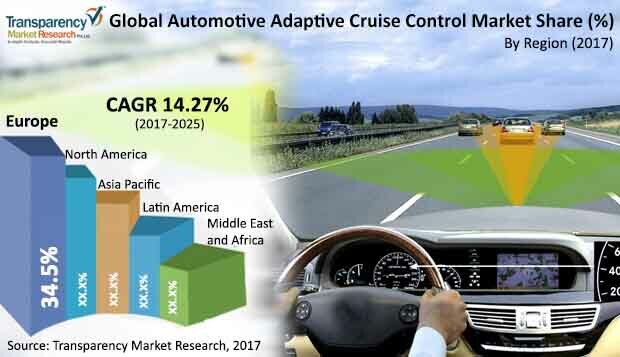 In terms of mode of operation, the adaptive cruise control system market is segregated as, normal adaptive cruise control system and connected adaptive cruise control system. Normal adaptive cruise control system segment holds largest share of 97.51% of the total adaptive cruise control system market. The connected adaptive cruise control system segment is likely to boost in the market with the increased demand for the autonomous vehicles. The automotive adaptive cruise control industry is highly fragmented with the presence of small and medium sized manufacturers. Robert Bosch GmbH, Continental AG, ZF Friedrichshafen AG, DENSO CORPORATION, Delphi Automotive LLP, Preco Electronics, Autoliv Inc., Valeo, Magna International, WABCO, Hitachi Ltd., and Mando Corp. are major players operating in the market of adaptive cruise control system.